Thankfully, Autopsy.io isn’t “Uber for hearses”. Rather, it’s a newly-launched site that collects stories of startup failure, with the aim of sharing the lessons learned with the whole community. The Autopsy.io site itself is very much a ‘minimum viable product’: A spreadsheet that details the name of the startup, the idea, the reason for failure, and links to blog posts and Twitter handles. The undertakers behind the site are designers Maryam Mazraei and Matthew Davies, who run remote Web studio Milc, and Niral Patel, Marketing Manager at Sameroom.io. While the idea came up in September 2014, it wasn’t until earlier this year that the trio got around to making it a reality. It’s worth noting that profane sites on the startup failure have a heritage. Philip Kaplan’s Fucked Company was the grandfather of the genre, chronicling tech disasters in the days of the first dotcom boom. After a few hours work, we had the first version of the website ready. But it never really took off. The name was average and the site was worse. They scrapped that version and started again with the current name and simple spreadsheet design. This time it flew, reaching the top spot on HackerNews and Product Hunt, and receiving love from big names in the startup world. Brilliant! 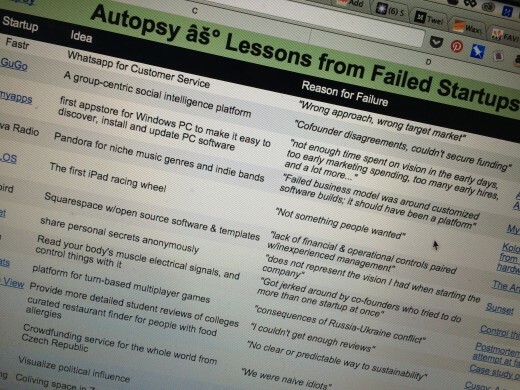 http://t.co/Saef5t7lbY "Autopsy ⚰ Lessons from Failed Startups" — aka "Catalog of Future Successful Startups". Well done! The team hopes Autopsy will remain a positive place for entrepreneurs and founders to learn from startups that didn’t go the distance. They’re also planning an email newsletter, which you can sign up for on the site. I think the project makes an excellent companion piece to the fizzing excitement of Product Hunt. It’s not glorying in schadenfreude at other entrepreneurs’ failures, but creating a repository of shared knowledge on mistakes to avoid.